Kasubana is a "smart" robotic flower that blooms in a life-like manner upon sensing human proximity and then orients itself toward the human. An article in Technology Review (March 2005) showcasing several cool and futuristic inventions developed at the MIT Media Lab was the source of inspiration behind our project idea. 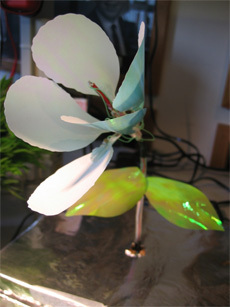 Among the various projects highlighted were two robotic flowers developed by the Robotic Life group, one of which could sense heat and orient itself toward people. Further research into this flower, named the Dragon Iris led to the discovery of video clips demonstrating the flower in action. Amazed by such an engaging robotic toy, we decided to create our own interactive flower for our final project in ECE 476 (Cornell University). We designed and created a microcontroller-powered mechanical flower that could bloom based on shape memory alloy actuation and detect human proximity using electric field imaging and capacitance sensing. A stepper motor was the driving force behind the flower's ability to orient itself in various directions. Our final design was a completely original, aesthetic and engaging robotic flower with a mind of its own.